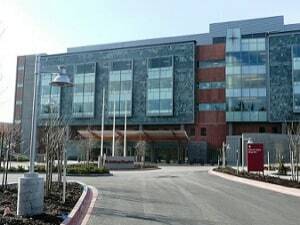 Peninsula Regional Medical Center is a 400-bed hospital located in Salisbury, Maryland, the largest city in Maryland's Eastern Shore. It is positioned on the Eastern Shore between the counties of Somerset, Worcester, Dorchester and the state of Delaware. It is part of the Peninsula Regional Health System, which includes a number of outlying clinics. It was established in 1897, and now has over 3,000 employees (one of the largest employers in Salisbury). It has over a half a billion dollars in assets. Peninsula Regional caters to much of the Eastern Shore and provides diverse services including emergency medicine and traumatic critical care, obstetrics (with over 2,000 births per year), cardiac care, a cancer center, orthopedic services and a wide variety of surgical procedures. It is particularly proud of its Peninsula Institute for Laparoscopic and Robotic Surgery, where they perform 1,500 laparoscopic and robotic surgeries per year. In 2018, these robotic surgeries now utilize the da Vinci Xi surgical robot, and Peninsula Regional advertises that its doctors are highly trained in its use. We know that hospitals enjoy advertising the robotic surgeries, thinking that it makes them "cutting edge." (Our lawyers know that patients should ask a lot of questions about the actual experience level of those doctors on these robots before agreeing to surgery.) PRMC was also named in 2018 as a 5-Star recipient from Healthgrades in both C-section and vaginal deliveries. Though it is traditionally thought of as a conservative jurisdiction, Wicomico County is on the rise, and personal injury verdicts are improving. There has been a number of six- and seven-figure medical malpractice settlements and verdicts in recent years. For serious cases, lawyers should have no qualms about placing their cases before a Wicomico County jury. $274,000 Verdict: Plaintiff is experiencing abdominal pain, nausea, and vomiting. She visits the emergency room at Peninsula where she works as a part-time employee. A physician’s assistant takes a flat film and reads the results as negative. The plaintiff disagrees with the assistant and claims the film shows the presence of a fecalith, a hard mass of feces, within the area of the appendix. The radiologist also reviews the film and does not see the fecalith, diagnosing and discharging the plaintiff with gastroenteritis. The plaintiff returns to the emergency room the next day with a high temperature and increased pains, particularly in her right, lower portion of her abdomen. Without reviewing the previous day’s film, the emergency room physician performs a pelvic exam and diagnoses the plaintiff with pelvic inflammatory disease. The plaintiff is discharged to an OB-GYN, who also diagnoses the plaintiff with gastroenteritis and prescribes her with medication and painkillers. Plaintiff, still experiencing pain, visits multiple clinics that give her similar results as the previous physicians and also rule out gallbladder disease. A week after the original diagnoses the plaintiff is seen by a surgeon and undergoes immediate surgery after discovering a walled-off perforated appendix. The plaintiff alleges the defendants, the physicians in the hospital emergency room, were negligent in missing the fecalith and in not performing a CAT scan. The defendants contended that missing a fecalith while reviewing a flat film is not looked down upon in the radiology field. The jury awards the plaintiff $274,000 after finding two doctors and the hospital liable for the damages. $850,000 Settlement. Doctor cut Plaintiff's iliac vein and artery, during surgery, causing this very nice woman a number of surgeries. Our lawyers handled this claim. $575,926 Verdict. Plaintiff underwent a hysterectomy at Peninsula Regional Medical Center. It was performed by two doctors (not for nothing, one of which was the also the doctor in the settlement above.) During the procedure, the plaintiff developed a bladder flap. During the repair, a stitch penetrated the bladder, leading to a fistula. She is left incontinent. Peninsula Regional is often defended by Cornblatt, Bennett, Penhallegon & Roberson lawyers John Penhallegon and Valeric Grove. Medical Bills can be obtained from the same address, but a different fax number: 410.543.7020. If you believe that you have a medical malpractice case against Peninsula Regional Medical Center, contact our medical malpractice attorneys at 800.553.8082, or send us a free internet request for consultation.